Since Goteo aims to develope a social network for free culture microfinancing based on the notion of community profit introducing the possibility of returning money in the form of packets of "training" and educational methodogies, FLOSS code or physical products such as open hardware or open design, we have teamed up with openp2pdesign.org to publish a series of articles looking deeper at open communities business models. We start with an overview of Open Hardware which will be followed by 2 posts on Open Craft and Fablabs. Enjoy! The current Open Source Hardware Draft Definition is intended to help provide guidelines for the development and evaluation of licenses for Open Source Hardware and it says that Open Hardware is "a term for tangible artifacts -- machines, devices, or other physical things -- whose design has been released to the public in such a way that anyone can make, modify, distribute, and use those things". The main difference with Open Source Software is that Open Source Software is collaborative, while Open Hardware is derivative: here a fork is the rule, not the exception. Lists of existing Open Hardware projects can be found on the GOpen Hardware 2009 website, on the P2P Foundation website, on Make Magazine's Blog and Open Knowledge Foundation. Open Hardware projects are not limited to gadget and interaction design projects, but they can also be about development aid projects. 1. Closed: any hardware for which the creator of the hardware will not release any information. 2. Open Interface: all the documentation on how to make a piece of hardware perform the function for which it is designed is available (minimum level of openness). 3. Open Design: in which enough detailed documentation is provided that a functionally compatible device could be created by a third party. 4. Open Implementation: the complete bill of materials necessary to construct the device is available. Arduino is arguably the most popular Open Hardware project: an open-source electronics prototyping platform based on flexible, easy-to-use hardware and software; many versions of the Arduino hardware have been commercially produced to date. It's intended for artists, designers, hobbyists, and anyone interested in creating interactive objects or environments. You can read a comprehensive introduction to Arduino on Wikipedia or on Alicia Gibbs thesis (PDF). Most of Arduino official boards are manufactured by SmartProjects in Italy. The Arduino Pro, Pro Mini, and LilyPad are manufactured by SparkFun Electronics (USA). The Arduino Nano is manufactured by Gravitech (USA). 4. it is a mature and simple enough project. The designs for the Arduino board are released under the Creative Commons license Attribution-Share Alike: you can produce copies of the board, redesign it, or even sell boards that copy the design without paying a license fee or even ask permission (you just have to credit the original Arduino group and use the same CC license). The only piece of intellectual property the team reserved was the name Arduino, which is trademarked: if you want to sell boards using that name, you have to pay a small fee to Arduino (this is set in order to make sure the Arduino brand name isn't hurt by low-quality copies). 2. selling the hardware but trying to keep ahead of competition with better products (users will buy your products because are better than the copies, but the copies will help your products become more famous). Clive Thompson (Wired) concluded that Open Hardware is a sign that hardware is becoming a commodity and that it still has not clear business models: it's possible that open source hardware will not compete with the for-profit world but will instead fill niches otherwise ignored. In May 2010 Philip Torrone and Limor Fried collected 13 examples of companies that are selling open source hardware: according to them, these companies, generate a turnover of about $ 50 million and there are currently about 200 open source hardware projects of this kind. 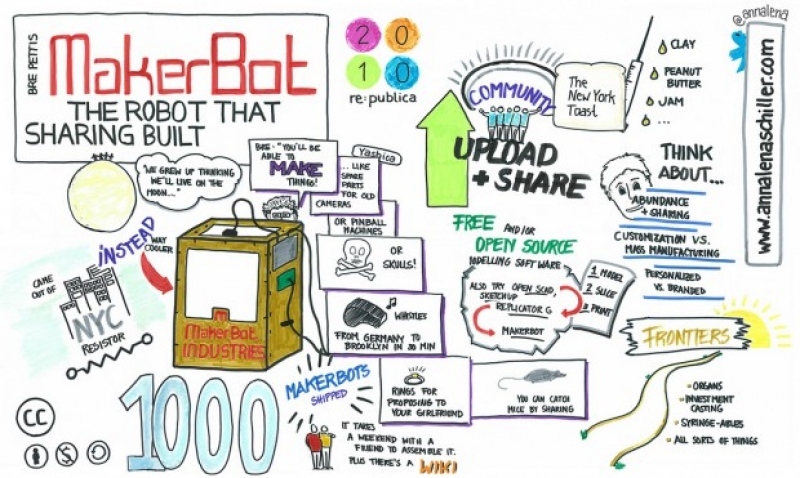 They project the open source hardware community to reach $ 1 billion by 2015. Adafruit, Arduino, Chumby and Liquidware have each one $ 1 million in revenue, and Torrone and Fried estimated them to reach a $ 5 million revenue soon (while many other companies will reach a $ 1 million revenue). Sparkfun alone has even a $ 10 million revenue. 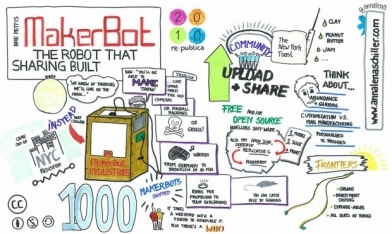 In January 2010, Joseph Flaherty calculated that the MMakerbot (an open hardware 3D printer produced by a 3-person firm) has a revenue of $ 1,350,000-1,710,000 (1,800 * $ 750-950). The industry leader Stratasys (which uses a FDM technology similar to MakerBot) had a total revenue of $ 124,500,000 in 2008, but with a considerably bigger firm and more R&D investments. And MarkeBot has just opened a retail store in New York called the Botcave.